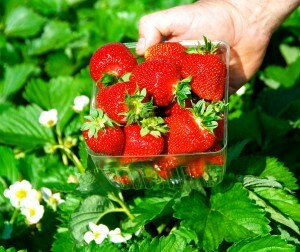 Strawberries Mark the Beginning of the Season! How do we grow our Berries? What makes our Berries taste so good? That is a hard question to answer but I’m convinced it is from growing in a living, organic soil full of microbes, organic matter, micro and macro nutrients alike. We water the berries heavily during the fruiting season using the water conserving drip irrigation system. 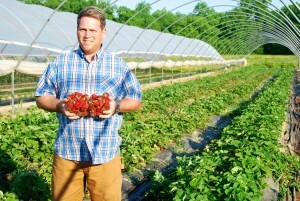 Most importantly, the berries are allowed to fully ripen on the plant before we harvest them. The mid May heat, sunshine, organic soil and water are the perfect combination to create a sweet, juicy strawberry’ie taste. Come get your Delvin Farms strawberries at any of our farmers markets starting end of April til early June or secure your order by signing up for our CSA program. 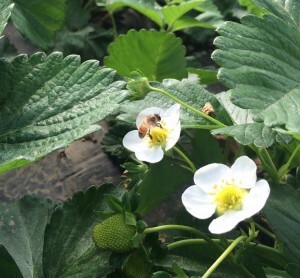 The 2015 season is shaping up to be a great year for the berries with big plants, lots of blooms and mild temperatures. Come early to the markets as they sell out fast !! This entry was posted in CSA and tagged csa, delvin farms, farmers markets, organic, ripen, strawberries, taste, whole foods market on April 21, 2015 .